For many of us, food is more than a source of nutrients. It’s a cultural, social event, one that brings people together. We’re willing to bet that some of your favorite memories may be meals shared with a parent or loved one. And this can make it all that much harder when that same parent seems to be losing interest in food as they age. Of course, older people tend to eat less overall. Over time, our metabolic rates decrease, which tends to cause us to need fewer calories. So a slightly decreased appetite in a loved one may not necessarily be cause for alarm, at least at first. But what if your family member never seems to be eating at all? What if they forget to eat, or consistently turn down food? What if they’re losing weight at a rapid clip? When is it time to step in and take action? Let’s explore some of the signs that your parent or older family member may not be eating well enough – as well as some of the root causes that may be to blame, and what steps you can take to help. Has your loved one lost a noticeable amount of weight? Are their clothes fitting more loosely? Do they seem to be weak or sluggish, perhaps due to poor nutrition? All of these are signs that it may be time to get involved. Does your older loved one consistently turn down the chance to eat or drink? Do they always say that they’re not hungry, no matter how hard you try to convince them to eat? The cause could be related to depression, loss of taste, altered appetite due to medication, or any number of serious factors. Changes to your loved one’s housekeeping habits in general may trigger warning bells. In particular, take notice of the kitchen. Is there spoiled food in the fridge? Are cans and boxes in the pantry completely unopened? Are plates and silverware gathering dust? Your parent may not be using the kitchen due to mobility issues, cognitive issues, or simply because they don’t want to prepare a meal for one. In any case, a failure or inability to use the kitchen regularly could be a sign that your parent is also failing to eat properly. From age nine to age 95, proper nutrition is incredibly important. However, many elderly people tend to forego healthy habits for eating and drinking over time. Our senses tend to get less sharp over time, and can also be affected by medications and plenty of other external factors. For many seniors, a decline in their ability to smell and taste can translate directly into lower appetite and less interest in cooking or eating. The same goes for vision – with less ability to see what they’re eating, many seniors tend to lose interest in food. To make matters worse, losing any or all of these senses can make it a lot harder to get going in the kitchen, and many seniors may stop preparing meals altogether as a result. Some of the medications that a senior might take – such as Alzheimer’s medication, anti-depressants, or stimulants – can have the unfortunate side effect of altering their appetite. In other cases, indirect side effects from medications, like diarrhea, nausea, vomiting, constipation, or dry mouth, can put some people off eating. For many older adults, just making it to the kitchen in order to prepare a meal can be a challenge, due to any number of causes. Many seniors can face feelings of loneliness or depression that make them unwilling to prepare a meal solo, for example. For others, it may be an issue of mobility. It’s quite hard to cook when it’s difficult to walk, or lift heavy pots and pans. Finally, cognitive decline can play a role, as well. Many seniors may lose track of time and skip meals, or simply forget to eat. For some seniors, digestive health may be a factor that is limiting appetite. Many people with digestive issues may be put off from eating, for fear of triggering unwanted symptoms. For others, constipation can create a lingering feeling of being “full,” which might cause your loved one to stop eating or drinking properly. In other cases, the problem might be oral health. Over time, issues with teeth, gums, or dentures can cause discomfort or trouble chewing or swallowing, which can make eating feel like more trouble than it’s worth. This is a major, major factor for many people! In a lot of ways, sharing a meal is one of the most important social activities we have. From huge holiday dinner parties, to workday lunch breaks, to Friday night family meals, food has a special place for many of us. This can make preparing meals and eating alone feel like a lonely experience. Without people to share stories or jokes with, eating might just seem like a less desirable activity. Getting more involved with your family member’s meal prep may help them get the nutritious food they need – and help protect your peace of mind. There are lots of little things you can do to help. For instance, you may wish to take the step of planning a menu of nutritionally dense, well-portioned meals for your family member, to help take that burden off of them. You may also help by preparing portion-sized snacks that don’t require any additional cutting or work, such as bite-sized pieces of cheese or lunch meat, or ready-to-microwave bags of veggies. One important thing to do? Keep your eyes and ears open for any further signs of trouble. Listen to your loved one’s preferences, and try to take their wants and needs into consideration. It’s far more likely that they’ll eat if you help them to prepare foods that they enjoy in the first place. 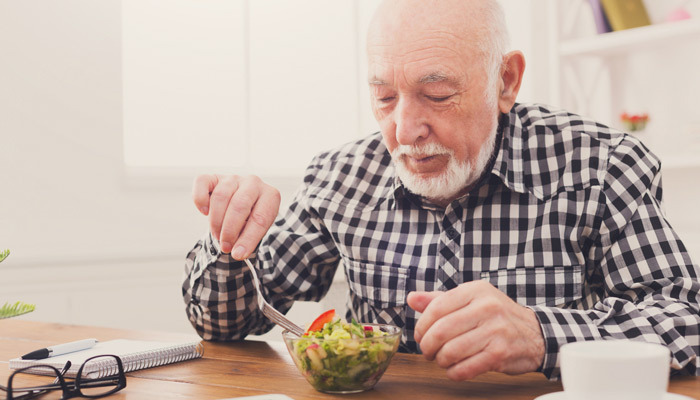 Pay attention to how your loved one is eating, look for signs of cognitive decline or behavioral changes, and make sure that they stay current with doctor’s visits. The sooner you can recognize a problem and explain it to a medical professional, the sooner that healthcare provider might be able to help take the appropriate steps, whether that means switching medications, or changing up your loved one’s oral health routine. Finally, remember that preparing and eating meals is a great chance to spend time together and catch up – and this little bit of companionship could make all the difference when it comes to getting your parent to eat better. Research suggests that seniors tend to eat more and make better food choices in social settings. If possible, try to eat meals together a few times per week. You might also want to find time to take your loved one shopping for groceries they’re more likely to use. This is a great bonding activity, and an effective way to help your parent be more mindful of their diet. Of course, taking the steps necessary to help your aging loved one can be tricky, especially when you need to balance your caregiving responsibilities with having to cook, clean, and provide for yourself and your family. That’s where Companions for Seniors would love to step in and help! We are a home care company that helps seniors maintain a higher quality of life, while also providing respite and relief for family caregivers who may need additional support. We’ll help develop a personalized care plan that allows your loved one to live independently in the comfort of their own home, with the companionship they need to remain active physically, mentally, emotionally, and spiritually. Our companions understand the enormous impact that a social mealtime can have on a senior’s overall health, and we make it a point of emphasis when it comes to the care we provide. We can help with everything from grocery shopping, to meal prep, to simply helping your loved one share a meal with a friendly, familiar face. We don’t look at cooking for our clients as a chore, but a privilege and an amazing chance to connect and learn more about their lifetime’s worth of stories. If you have a loved one that could benefit from regular home-cooked meals and company, we’d be more than happy to help! Drop us a line or give us a call today to get the conversation started!